Falling down the rabbit hole on a Saturday afternoon never felt better. 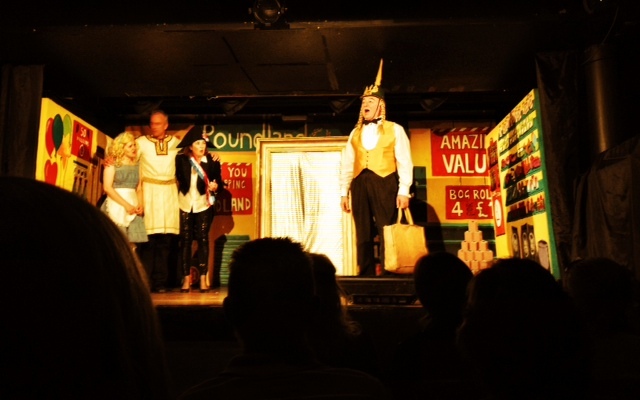 At least if a Play, Pie and a Pint’s Alice in Poundland has anything to do with it. As the name suggest, lunch-time theatre at Oran Mor includes pub-grub pie (or quiche) and a pint of your choosing – even Guinness or a glass of wine if beer isn’t your thing. But the pie and pint are merely appetisers for what’s on offer. Alice in pound-land is panto for grown-ups at its best. You’ll meet familiar reinvented poundland characters along with a few new personalities– a clucking hen-night-hen among my favourites. This wacky wonderland-inspired story is fused together with nods to Glasgow and a timely recession-driven twist that had us chortling in our seats. Even my reluctant companion had to admit that it was one of the funniest things he’d seen in a while. Energetic, entertaining and laugh-out-loud funny– don’t be late for this very important date because their Poundland run will be coming to an end as of Saturday 28 July. It’s marvellous to the think that underneath Oran Mor’s regular pub banter and drinking, a totally energising show is unfolding. So escape soggy summer and brighten up your afternoon at a Play, Pie and a Pint. And if you can’t make Alice in Poundland, be sure to catch one of their other afternoon theatrical offerings. Shows run Monday – Saturday, 1pm and 3pm, £8-12.50 – depending on the day and time. Unreserved seating so be sure to get there early.